Her Excellency the Governor Helen Kilpatrick CB, in conjunction with the Cayman Society of Architects, Surveyors & Engineers (CASE) and the Cayman Contractors Association (CCA), has launched the fifth national Governors Awards for Design and Construction Excellence in the Cayman Islands. 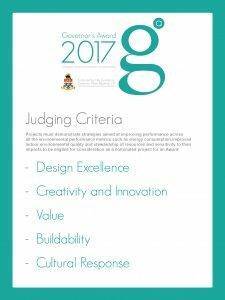 The Governor’s Award continues to encourage, foster and maintain innovation, sustainability and excellence in the Cayman Islands construction industry and 2017 is expected to indemnify further projects of distinction within the local community. For information on nominations, please see the full criteria and supporting information here. Please refer to the example PP nominated project presentation (downloadable here) as well as to previous Award nominee presentations (accessible here). The deadline for applications is 6pm, Friday 17th November 2017.